Did the long run today. Got to run down Peachtree and see some of the setup for the road race tomorrow. Cheshire Bridge Workout by onetruebob at Garmin Connect – Details. A trumpet player keeps his own beat when performing with the jazz ensemble in the Galleria Gardens. So, I’m going to run a marathon. Today I started the training program that I hope will take me there. 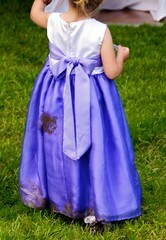 I’ll say more about about whys and hows later. However, since today was the first official training day, I thought I’d mark the occasion by getting some of the first workout on video. What a lovely sight to be greeted with first thing in the morning. 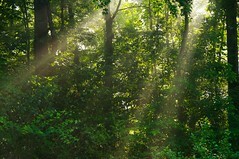 Taken in the back yard of my home in LaVista Park. 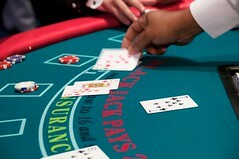 Playing blackjack for prizes at the 2010 Silverpop Client Summit. 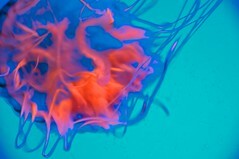 Slowly drifting and catching the light, the inside of the jelly fish seemed to burst into flame. Taken at the Georgia Aquarium during the 2010 Silverpop Client Summit. 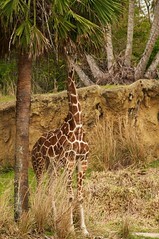 A giraffe tries to hide from the tour buy posing as a palm tree. Taken in the Harambe Wildlife Preserve as part of the Kilamanjaro Safaris at Disney’s Animal Kingdom park.